It isn’t surprising that the idea of death freaks people out. It’s sort of the combination of three of the worst and most common fears in the world: change, endings, and the unknown. You could probably argue that they’re all the same thing, but it doesn’t change the fact that it gets friggen spooky! Since nobody knows what death really looks like, none of us are quite sure what to expect. And, the drawings that we’ve put together from various cultures throughout the world doesn’t make the idea any more inviting. Of course, we’ve also been taught all our lives not to judge a book by its cover. But turns out that Death looks pretty much like you’d expect. It’s awful. But, that doesn’t mean it isn’t also a little friendly. Each Death really gets to decide that stuff for themselves. In fact, perhaps it might be a little relaxing to get to know what that is like. You can do so by adding this White Skull Mask to any of you existing outfits to give yourself just that extra spooky doom factor and maybe see what it is like to see through Death’s eyes. 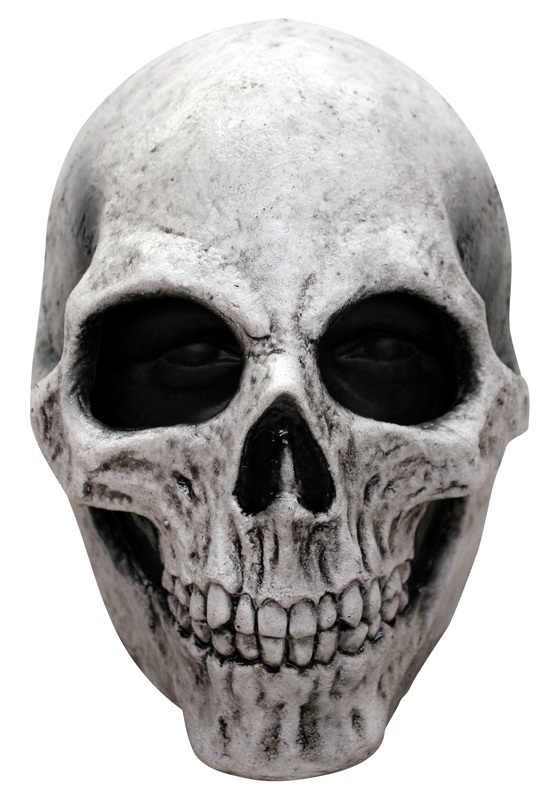 It’s pretty literally true as this molded latex mask is formed to cover your entire head and look just like a human skull while providing plenty of room to see through. Throw this under a hooded cloak or phantom costume and you’ll have everyone now feeling at least one of those three fears about you for once! Fits well and is great quality!